Grab your kids and family and climb up the massive dual lane slide. Slide your way to the bottom on this thrill ride! Standing at 24' tall and a platform of 18' this is an amazing and one of the funnest slides in WNY! THe Dual Lane slide has a massive stair way made for kids and adults, once at the top you look over the whole city in your wildest imagination and slide to safety. 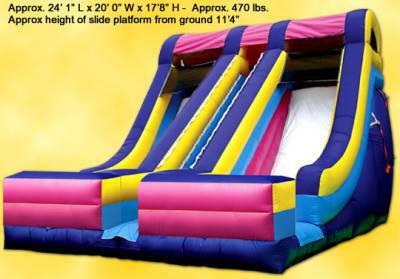 This inflatable is one of WNY Largest Dry Slide!